HIBS fight back from 1-0 down to win a place in the fifth round of the Scottish Cup against Championship rivals Alloa at Recreation Park. 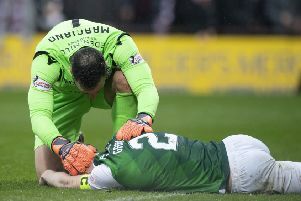 The hosts went ahead after 15 minutes when Daryll Meggatt’s long-range effort squirmed underneath Hibs goalkeeper Mark Oxley. But Hibs hit back 13 minutes later through Liam Craig’s powerful free-kick into the bottom corner. And the visitors took the lead before half-time when David Gray headed in Scott Allan’s cross for what proved to be the winner. Hibs had to play the last three minutes with 10 men after Dominique Malonga saw red for an off-the-ball incident.